Hope you had a great time splashing! Then spread the word, so others can benefit! This time before the sky there is an exercise that we have to practice to get into the groove. Step I Pick some colours, you could choose your favorite sky colouts. If you mix and blend you will et new colours that will be your own ormyls. 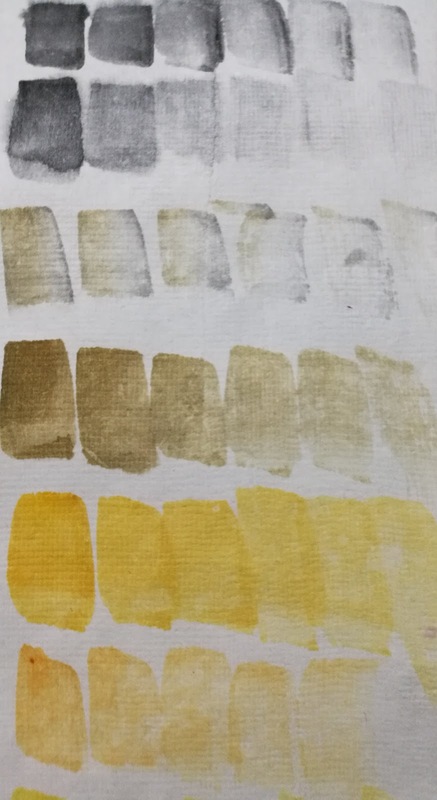 Try noting immediately as you watercolour wet in wet which means you work on a wet paper and drop in colours or Wet in dry yeah it's you take watery colours to the paper. Let's try the wet in dry fur this exercise. Take a strong value of watercolour. Just mix a strong colour without much water just enough on your brush. Then for the next add water to your brush. /yeah a lighter value emerges. Continue this adding more water till you get plain paper.Try the black also. This way you will get to learn values later when you paint objects, scenes, flowers anything you desire. It would be great if you can add the name of the colour so you can keep it as a handy chart.. In fact i have mentioned about making a chart of all your colours. When you match a colour , you can see how close your colour. Start with primaries i.e red, blue, yellow and then mix red with blue and each primary gets a secondary. Confused? For now have fun mixing colours and check if you have these colours. have a Splash! Have fun!